My first baby, Lydia, was delivered by c-section a little over 5 years and I well recall what things were like in the days and weeks following her birth. Aside from the fact that I was recovering from an extremely traumatic birth experience and postpartum PTSD, several other things came into play that made my recovery more difficult than I expected. Lydia had colic and she cried all day and all night. She couldn’t be consoled even at my breast because she had rejected my breastmilk. She had projectile vomiting from reflux which meant that I was daily having to bend to clean up her spit-up. That would have been fine except for the fact that I was trying to recover from major surgery and severe blood loss. Bending over to clean or even to pick her up was terribly difficult for me. We lived in a third-story apartment and had downsized to one car. So I had no help, no car, and had to go up and down all those stairs to get anywhere. With a screaming baby. It wasn’t what I thought being a mom would be like. 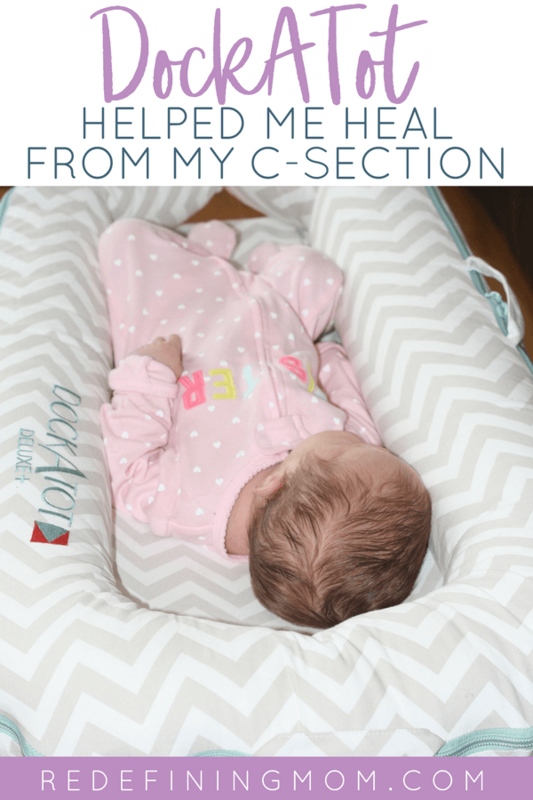 As I started organizing all of the baby essentials I needed and preparing for my second c-section, I knew without a doubt that I had to do things differently this time. I needed more help and I needed to make things as convenient as possible for myself on a daily basis. In this post, I am sharing one of the ways I made sure that could happen. I received this product compliments of DockATot. All opinions expressed are my own. Please remember to never leave your baby unsupervised while in the DockATot. The physical recovery from a c-section can either be great or it can be really long and difficult. A lot of that depends on whether you have anybody to help you and on the physical demands you place on your recovering body. Lifting a baby can be a huge strain on a post-op mom. In order to reduce that strain, I have been using the DockATot. This thing is amazing and has literally changed my days with my newborn daughter, Maria. Because the DockATot is made of 100% cotton, it isn’t heavy. There’s no strain on my back to lift it and carry it around. I can’t even imagine having to pick up a heavy car seat or swing and carry it around the house wherever I am just so the baby can be near me. Can you say “busting stitches?” No, thank you. I strictly use the DockATot as a lounger for baby. Why does baby need her own “lounger”? Let me share how I am using it in my home. I have shared before that our house is on the smallish side for a family of 4. That means I can’t be moving a big swing or even a bassinet around throughout the house for my baby to be near me during the day. I am not much of a baby-wearing type of Mom so wraps, slings, and carriers aren’t an option for me. And yet I still need a way to keep my Maria near me without having to hold her every second. Because I actually still have things I need to accomplish. There are times when it wouldn’t be safe for me to be holding her, like when I am cooking. Or in the shower. When I am sitting on the couch working or watching television or just resting, I know that she is safely beside me and that she is comfortable and happy. One of the great things about the DockATot is the way it keeps the temperature just right for Maria. We all pay a lot of attention to the temperature inside our homes, and even in our cars, making sure that we are comfortable. We like for the climate to be just right. But babies also deal with micro-climates. I know you’ve seen your baby get too overheated in their car seat or swing. And then they can develop a heat rash that is just so uncomfortable. Their tender, delicate skin turns red and bumpy and you just know it must feel terrible. With this product, that is never a concern. This lounger does not harbor heat, so your baby will remain comfortable and cool no matter what the weather is like. I think one reason that Maria loves being in the DockATot is that it basically reinvents the womb. Our babies spend upwards of 40 weeks in the womb where they feel snuggled and held tight. A bassinet, car seat, or swing doesn’t offer that same feeling of security for babies. With too much side room, babies tend to flail about and their startle reflex is overstimulated. This lounger helps baby to feel secure and safe. 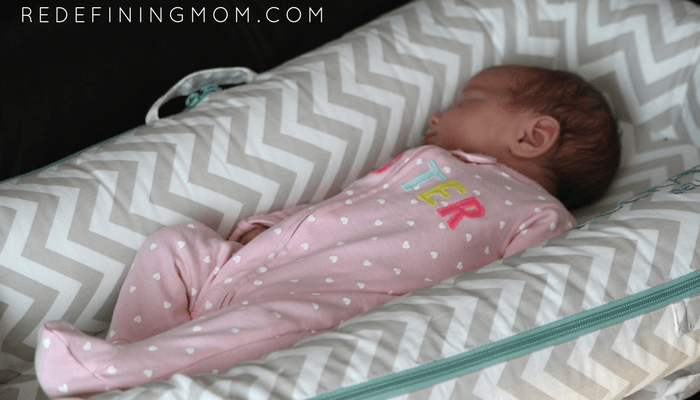 I can’t recommend the DockATot highly enough. Whether you’ve had a c-section or a vaginal birth, you have to take it easy those first few weeks and this thing makes that completely doable. With several fabrics and two sizes to choose from, there is a DockATot that will meet your needs perfectly. This one thing has made a huge difference for me after my second c-section. It has helped me to heal more quickly and more fully. It provides a safe place for my daughter where she feels safe and secure. 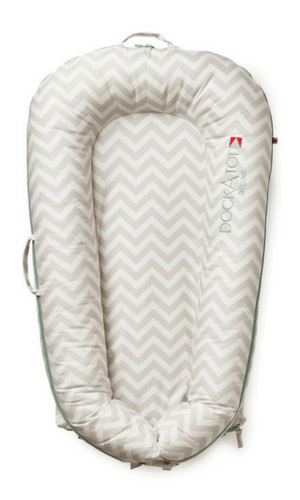 If I do have another child, which I can actually say might happen, I will definitely use the DockATot again. I wouldn’t want to be without it. Click here to get your DockATot! Creating an Amazon Baby Registry is an awesome way for your friends and family to buy you everything the baby needs. My sister shipped me a ton of things from across the country. Easy peasy! Plus, you get up to a 15% completion discount for things you’re still missing! I agree with everything you mentioned here. 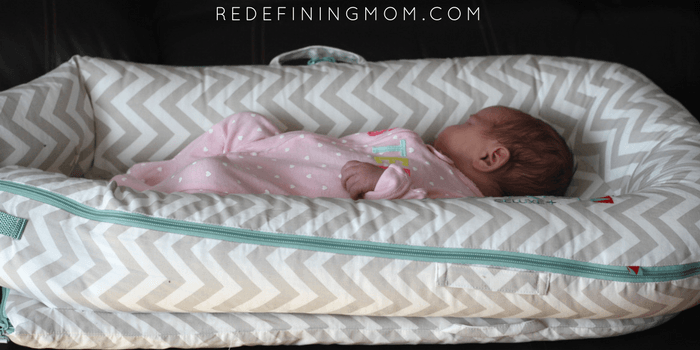 I have a DockATot and we used it for the my youngest child. It was given as a gift from my sister-in-law. I loved it, even my husband loved it. We co-sleep and it was very helpful. We used it since our baby boy was a newborn until he was around 6 or 7 months.